The training program “DISHA – Capacity Building of Indian Oil Dealers” was successfully conducted on 27 – 28 October, 2017. The program saw enthusiastic participation of 33 dealers of Indian Oil Corporation. 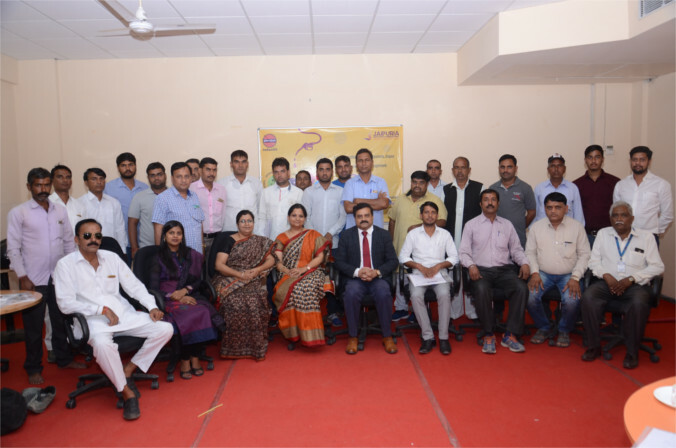 The program was inaugurated in presence of Dr. Anurag Singh, Dr. Prashant Gupta, Dr. Nidhi Vashishth Jaipuria Jaipur and senior officials from IOC – Mr. A. P. Singh (Senior Manager – Retail Sales) and Mr. Chandra Mohan. The day began with the lighting of lamp and seeking blessings of Goddess Saraswati. Dr. Nidhi Vashishth, Head – MDP, training & consultancy welcomed the candidates & deliberated on the content of the program. Dr. Anurag Singh, Dean – Academics conducted a session on Importance of Service sector in Economy. He discussed challenges and opportunities in service sector. The live examples from the industry were very impactful and witnessed participation from all. Dr. Nidhi Vashishth, Head MDP Training and Consultancy conducted a session on Customer acquisition and retention. She discussed role and importance of the customer facing employees and their competency scoreboard. Role plays and activities around customer care were conducted to make it an interactive and engaging session. Dr. Swati Soni, Area Chair – Marketing Jaipuria Jaipur, conducted a very interactive and engaging session on Innovative Sales and, Enlarging Customer Acquisition by Sales and promotions. Next session on “Effective People Management” ” was conducted by Dr. Daneshwar Sharma, faculty- Business Communication. It was an interactive session with videos and discussion on managing employee life cycle and the importance of recruitment to retention. Dr. Prashant Gupta conducted a session on factors driving profitability. The session also emphasized upon important steps to improve profitability and the measures to drive sustained profitability. Mr. Chandra Mohan from IOC engaged the audience with his practical approach. He discussed various technologically enabled customer connect initiatives. Dr. Prabhat Pankaj, Director awarded the participants in the valedictory ceremony with certificates and memento as a token of remembrance and MDP received positive feedback from the dealers about the overall program.